Call extensions will automatically pull phone numbers featured on landing pages. January 10, 5:35pm ET: This article has been updated with more information about automatic call extensions. In the second update in a week on how phone numbers display in ads, Google has begun alerting some advertisers that call extensions will start generating automatically as of February 6, 2017. The notice, emailed to advertisers that use “landing pages prominently featuring a phone number,” started going out on Monday evening. A copy of the full email is below. Though you wouldn’t know it from reading this email, call extensions are already set up with the phone number on the landing pages used in this specific account. From what I can tell, the change shouldn’t affect much for this account, though it sounds as if impression volume for call extensions generally will likely go up come February 6. Reporting for automatic call extensions will be available at the campaign or ad group level. They will not be reported in the automated extension report, either, but in the main call extension report. That at least means that you’ll be able to see all numbers being used for call extensions–whether of your doing or Google’s–in one location. A Google spokesperson has confirmed that if you do have call extensions set up in a campaign, Google will not add other call extensions. For advertisers using dynamic phone numbers on landing pages and are not using call extensions, the Google spokesperson says that for now it will screen for those scenarios and not generate automatic call extensions when dynamic phone numbers are detected on the landing pages. However, in situations where advertisers don’t want to pay for calls directed to the phone number listed on their landing pages (or any calls, for that matter), they can opt out before February 6. To opt out, check the “Do not use specific automated extensions for this account” option available at the bottom of the Automated extensions report from the Ad extensions tab in AdWords. Google has now added an option in the list of automated extensions. 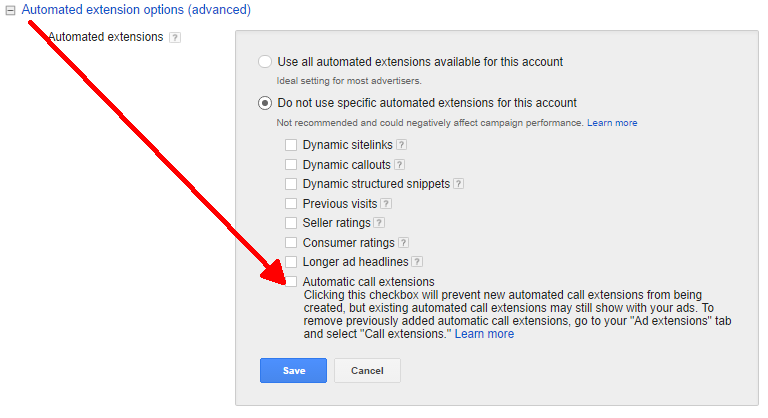 Note, that if you check this after February 6, you may need to remove any automated call extensions that Google generated from under the Call extensions section in the Ad extensions tab. Last week, Google began notifying advertisers that as of January 19, it may show location-specific phone numbers when location extensions display, even if a different number is used in call extensions.